I don’t have a lot to write tonight so I’m just going to catch up on a few things that didn’t make it into previous blogs this week. cheese·cake (ch z k k )n.1. A cake made of sweetened cottage cheese or cream cheese, eggs, milk, sugar, and flavorings. 2. Informal Photographs of minimally attired women. As most of us know, cheesecake is really more a pie than a cake but we all accept, due to common usage, that one can call a sweetened cheese pie a cheesecake. What I don’t think is commonly accepted is calling something a cheesecake when it is neither a pie nor made with cheese. In the DFAC world, however, these are not prerequisites for labeling something cheesecake. If they feel they must label something as cheesecake, I’d prefer they go with definition 2. At the Cambridge, I had something called cheesecake that was really just vanilla pudding (in the proper sense of the word not the Cambridge sense) on a crumbly crust. Then, just a couple of days later there was a chocolate “cheesecake” at IH that was a cloyingly sweet thick, yet cheeseless, pie. In the past, Cambridge and Lux have had excellent real cheesecake that was even in a rectangular, cake-like shape (the whole cake that is really a pie thing irks me). I don’t know who has led them astray but I suspect the fruity casserole cook. A bunch of US Navy folks were sitting beside us at dinner at IH the other night. Yeah, ya gotta wonder if, when the recruiter said “Join the Navy, See the World”, they ever imagined he was talking about the land-locked desert part of the world. One of his tablemates was looking dejectedly at her dried out chicken when he said “Want some ketchup with that?” and proceeded to produce two little packages of Heinz ketchup from his pocket. He explained that the UAE produced ketchup they have that the IH tastes “like it got contaminated with oil at the factory”. Apparently, he fills up his pockets with Heinz when he’s at the Cambridge or Lux. Only in KAF. There must also be some sort of market in hot silverware here too. We saw this sign at All Seasons. 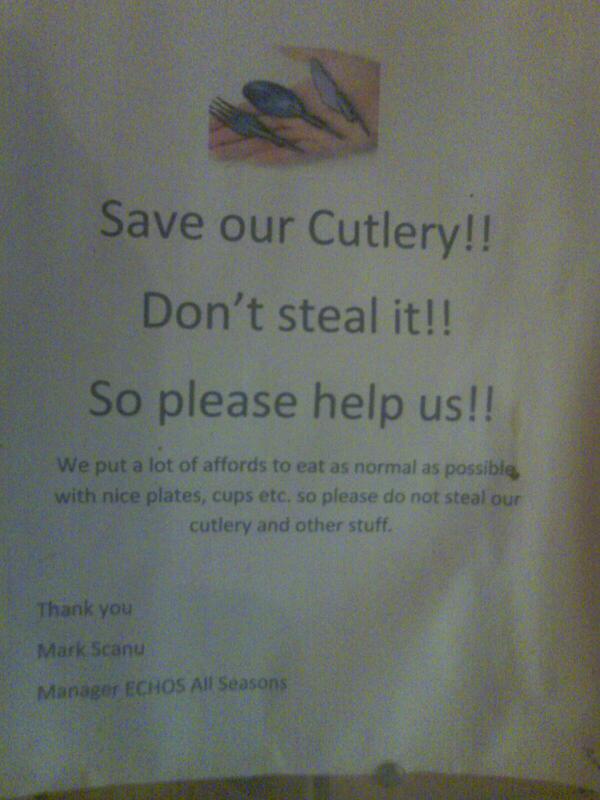 I appreciate all of the affords they put into things but I gotta wonder if politeness works with thieves. Maybe people are taking them to use in their battle against the Cambridge’s Sunday night roast beef. I know that TGI Friday’s isn’t stealing them; they lift all their cutlery from Pizza Hut. We went to the Niagara for dinner tonight. I had an extremely thin, overcooked pork chop . It was a pretty tough to cut and as I struggled to have plastic triumph over sinew, my glass of orange juice sloshed all over my tray like it has many times before. 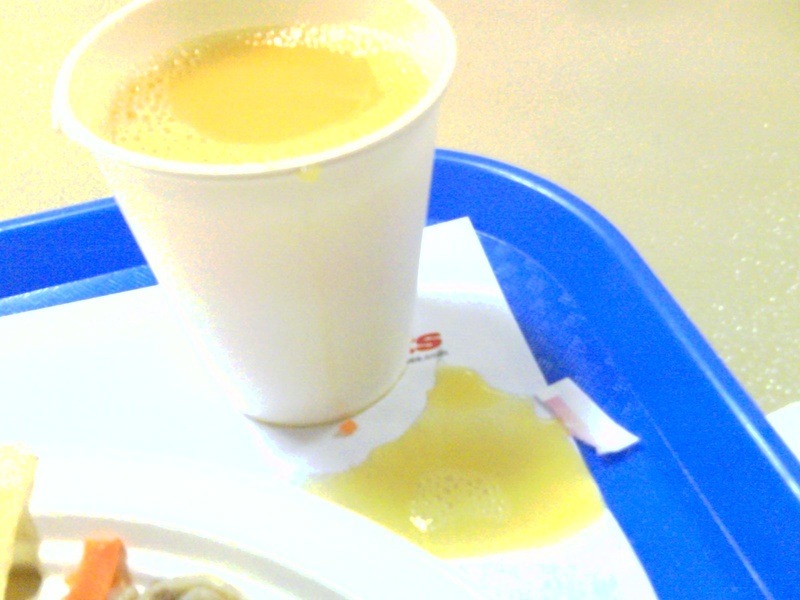 I cussed, as I am wont to do in such circumstances and M said calmly “You have to take your glass off the tray”. Why the hell haven’t I thought of this in over 2 years of spilling juice and water all over the damn place? I guess this kind of idiocy is to be expected of someone who orders the Cambridge roast beef every bloody week (yeah I did it again last night) and subjects themselves to three ice cream headaches in a row just because an ice tea slushie is soooo good. I’m tired so that’s all ya get tonight. This entry was posted in Cambridge, Independence Hall, Niagara by Kafoodie. Bookmark the permalink. I feel for your culinary deprivation! I’m going to send you a care package – with real ketchup, cheap (but metal) cutlery, and various other condiments for you to augment your meals. (why don’t you use your leatherman to cut the meat?). Hang in there, lots of good food waiting for you at home in just a short time. I was entertaining stealing cutlery from the cafeteria at HQ to send but the lovely box 761 beat me! As far as thinking of taking your glass of whatever you are drinking off your tray prior to attempting to cut your shoe-leather pork chop, I’m thinking it’s a combo of all the iced tea slushie/ice cream brain freezes that you have inflicted on yourself that has stopped you from thinking of doing this.